Our mission is the same as it was when we started up in 1998; to make the best hydrofoils money can buy. And now we offer several different models, so there is no doubt we have one that will fit your needs as well as your budget. Sky Ski, started in 1998 by Mike Murphy. Mike had previously been one of the founding members of Air Chair, the first sit-down Hydrofoil company. Being experienced riders ourselves, our main goal was to build & offer the best hydrofoils money could buy, right out of the box. 10 years later, our main goal really hasn’t changed, though almost everything else has. In 2004 Mike decided he really wasn’t the 9 to 5 guy (we pretty much knew that!). Sky Ski being Mike’s baby, he isn’t about to pass the torch to just anyone, so the search was on for someone who could take what he started and really make it fly. In steps Don Erb, & Comptech Machine who had already been making most of our high end, “Limited Edition” components for some time, to take over the reins. 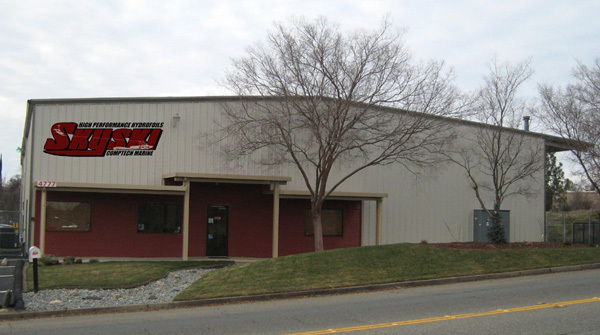 Comptech, in business since 1978 was already well known for their cutting edge design and machining capabilities in the professional auto racing industry. With Sky Ski, Comptech was ready to make the move to the marine industry and specifically, get into hydrofoils. With over 10 years behind us since the big switch, we’re really starting to feel right in our own skin. Under the guidance of owners Don & Brenda Erb, Team Sky Ski / Comptech Marine has brought more new & innovative products to Hydrofoiling in the last 12 years than in the previous 20 years that Hydrofoiling has been a sport! How do we do it? We start out by being hydrofoil enthusiasts ourselves, and with our 6 employees we have riders at all skill levels. We also utilize team riders who are on the cutting edge to test ride new equipment. With all this hands on experience & feedback we get from everyone, we know how to make things better. Build the best quality hydrofoils available. Provide personalized customer service & support. Our manufacturing headquarters are located in beautiful Redding California, just minutes away from where we love to ride as much as we can, Lake Shasta. If you are in the area we invite you to stop in and see us!